Because white-knuckling isn't a solution. 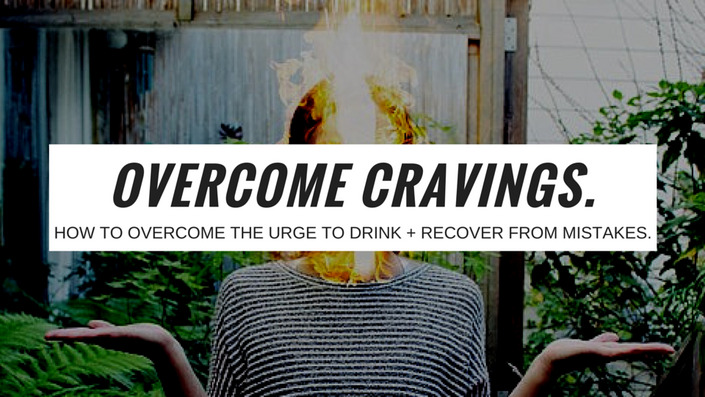 One of the more difficult and terrifying aspects of recovery from addiction is dealing with cravings. Cravings hurt and cravings are real suffering, and when we don't know how to prepare for them, weaken them, and deal with them when they hit us, we can feel pretty powerless and discouraged about the process and our future. Cravings are part of the process - where the rubber meets the road in recovery and where the real change is made. When we are empowered around our cravings (and our fails in our attempts to abstain) - when we understand how they work, why they happen, and how to use them to our advantage - we turn what are deemed terrifying and defeating experiences into our secret weapons. This course is designed to do just that - to turn one of the most painful parts of recovery into your power tool. You'll learn not only why cravings happen in the first place, but how to prepare for them ahead of time, how to handle them when they happen, and how to recover ourselves when they get the best of us (i.e., when we fail, slip, relapse, etc.). This course will also help you to incorporate four practices into your recovery that will help lessen the chances that cravings will happen in the first place. Module 1: Why a course on cravings and why a course on recovering from mistakes. Learn why engaging with cravings and mistakes is imperative. Module 2: What causes addiction + how cravings keep us stuck in the addictive cycle. Understand what leads to addiction, and what is necessary in order to break the addictive cycle. Overview of the Psychobiosocial Process Model (addiction cycle model). Understand the role cravings play in the addictive cycle and what craving is. Module 3: How to prepare for cravings. Explore the two most difficult times cravings impact us, and how to prepare for each. Understand why preparation is essential in successfully riding out a craving and how preparation can substantially increase our chances for success. Module 4: How to deal with cravings when they arise. Learn five essential methods to reframe and deal with cravings when they hit, and how to lean into cravings and use them to our advantage in recovery. Understand why cravings are actually a good thing and a sign that recovery is working as it should. Module 5: Four components of recovery that are essential to reduce the chances we'll encounter a craving, and eliminate cravings for good. Learn the four key components of recovery that are essential to weaken and eliminate cravings, with actionable steps to implement them in your own recovery. Module 6: How to recover from mistakes ("relapse" // "slips" // "fails"). Learn why failure is an essential part of recovery and not a sign that something is going wrong. Learn tricks to use mistakes to your advantage and an action plan you can implement after making a mistake (i.e., drinking when you had intended to abstain). Module 7: How to build a sobriety toolbox. Learn what a sobriety toolbox is, why they are important in recovery, and how to create one of your own. Plus get 27 tools you can use immediately. Course Workbook. A 25-page workbook that explores some of the concepts further, with links to all suggested tools and resources and 7 worksheets to help create personalized plans of action around the concepts learned. Course Slides. The full slide-deck used in the video lectures so you can review the material directly. 7 Video Modules. Seven individual live video lectures taught by Holly Whitaker of Hip Sobriety that go deep into the concepts presented and show you how to apply the concepts immediately. Bonus: How To Build A Sobriety Toolbox. A five page guide on how to create your own sobriety toolbox, complete with 27+ tools, and links to videos/tutorials. I am a writer, sobriety teacher and coach who creates tools, resources, and educational programs for those who are looking to create a modern, effective, individualized, and holistic path to recovery. Section 1: Introduction + Course Materials. Video Lecture 1: Introduction. (16 minutes). Section 2: Understanding What Addiction Is and How Cravings Work. Video Lecture 2: How addiction works, how cravings work (the Psychobiosocial Model). (14 minutes). Section 3: How To Prepare For Cravings. Video Lecture 3: How to prepare for for cravings. (25 minutes). Section 4: How To Deal With Cravings When They Arise. Video Lecture 4: How To Deal With Cravings When They Arise. (20 minutes). Section 5: Four Components Of Recovery That Can Help Prevent Cravings From Happening. Video Lecture 5: Four Components Of Recovery That Can Help Prevent Cravings From Happening. (20 minutes). Section 6: How To Recover From Mistakes. Video Lecture 6: How To Recover From Mistakes. (15 minutes). Section 7: Appendix - Building A Sobriety Toolbox. Video Lecture 7: Appendix - Building A Sobriety Toolbox. (7 minutes). This is for EVERYONE. All human beings - regardless if they are in recovery for substance abuse or not - deal with cravings because we are all wired to seek pleasure. The tools and lessons in this course are applicable to all humans who are looking to free themselves from cravings or from an addictive cycle. Specifically, this is directed to those who are either thinking about sobriety (preparing for it), those who are attempting sobriety and finding themselves suffering from cravings, or those who are well into sobriety and are looking for an additional sense of empowerment or who are still struggling with relapse and craving.